SansAmp Bass Driver DI, Bass Amp Simulator from Tech 21 in the SansAmp series. MGR/Golem's review"Tech 21 Bass Driver"
$89 used at Guitar Ctr Albany NY. sales and was just browsing around. Compactor, a compressor with EQ. It is both tube simulator and a DI box. I know what my Fender Bassman tube amps sound like, and know their limitations. at any level of drive-effect you choose. to be well worth the greater flexibility. an upgrade in tone control. Also has 1/4" output, plus another 1/4"
the 1/3 position [with roundwounds]. This is a very useful, flexible device. somewhat transforms the voice of your ax. it can turn a decent rig into a great one. 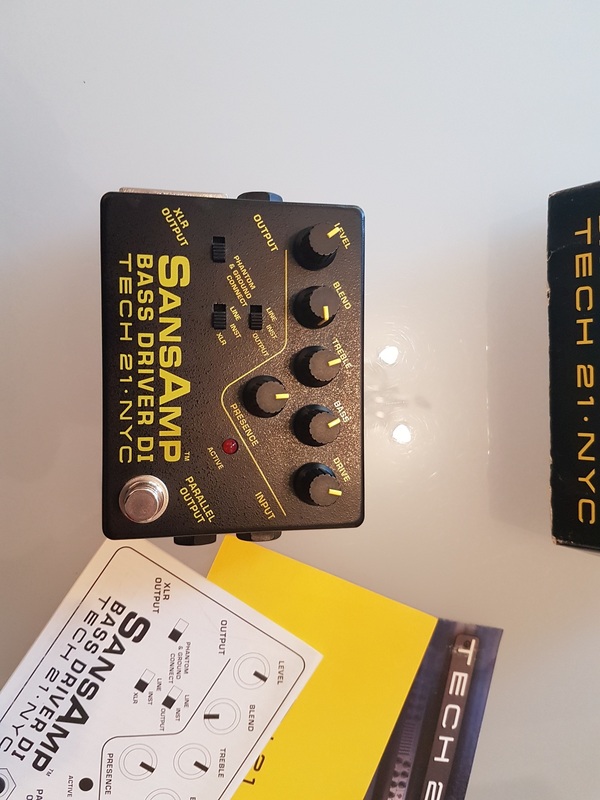 MGR/George Pallotta's review"Tech 21 Sans Amp Bass Pre-Amp Stomp Box"
If I was allowed only One Stomp Box Effects formy Bass Guitar, the Tech 21 Sans Amp would be it. This little Box blew away all the other Mono and Multi-Effects Modules I hooked my Bass into. It is very versitile, it allows you Funk and Fwap to R&B and Jazz and Drive Home the Bass line in a Heavy Metal Song with the "drive" knob. Turns your Average Bass guitar into a High End Bass with Rich, Full, and Solid Bass tones. Paid about 170.00 at an Online Musicgear site. It is simply the only Bass Effect Stomp Box you need to own! MGR/vinnyp's review"Tech 21 Sans Amp Bass Driver DI"
Great DI and love the active option (sounds great!)!! I wish the 1/4" output(to run effect into my rig or mixer) was on the outside, instead of in the middle of the XLR and power supply(on front panel?). When using 90 degree 1/4" patch cables it get's a little in the way if you use the XLR at the same time. It has a input and parallel out in back, but using the parallel out doesn't give the effect to my rig (which sounds great). Placement of unbalanced 1/4" output. 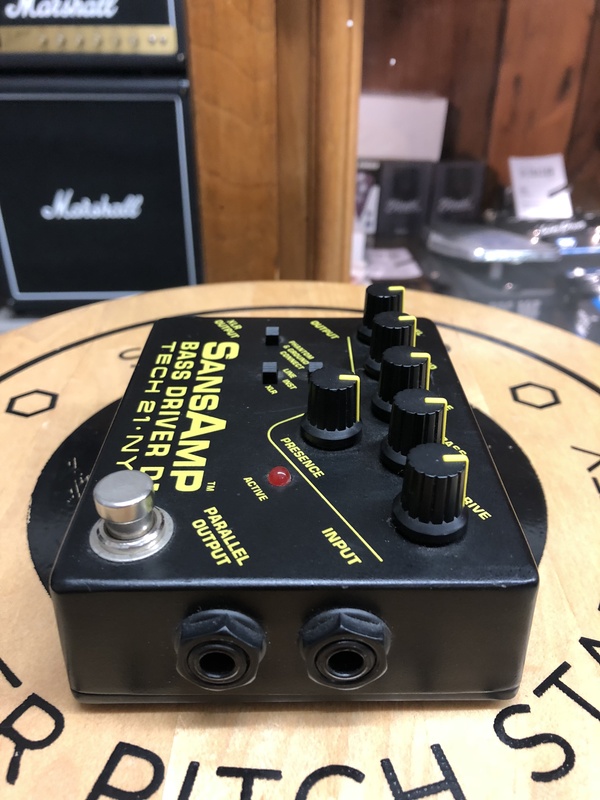 Tech 21's Sansamp Bass Driver DI is an awesome little box that offers both the flexibility of a direct input box, and the sound and control of a pedal. This is an analog piece of gear that has 1/4" connections for an input and two parallel outputs, and it also has an XLR output. It can be powered by a nine volt power supply and isn't rack mountable as it is controlled by your foot. 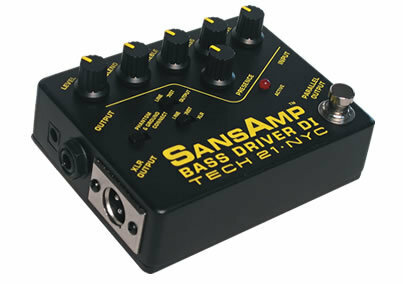 The make up of the Tech 21 Sansamp Bass Driver DI definitley makes it quite a flexible piece of gear. It can be used for live shows or in the studio, but I've only used it in the recording studio. As far as parameters go, it's got knobs for level, blend, treble, bass, drive, and presence, as well as a switch for phantom/ground. It then has a switch to engage or disengage the parameters. A manual shouldn't be necessary for most users. Both as a traditional DI box and as a pedal, the Tech 21 Sansamp Bass Driver DI excels when it comes to sound quality. I love the sound of this when used as a simple DI box, but when paired with it's ability to be used as a pedal, the palette of sounds increases exponentially. You can definitely get a good sounding drive with this for when you might be looking for some more crunch and not just a clean DI signal. I've only used it with bass guitar - a Fender P Bass, and since it is designed for bass I don't think that I'd recommend using it for anything else. Although Tech 21 does make other similar devices for non-bass instruments. The Tech 21 Sansamp Bass Driver DI is really the perfect combination of a DI box and an in depth bass pedal with a lot of control over your sound. I'd recommend that every bass player look into this, as it will definitely add a lot to both your live rig and in the studio. Studios should also consider having one of these around, as its the perfect one stop shop for recording bass guitar direct. All in all, deifnitely a reliable piece of gear with a great sound and a lot of flexibility.